Is It Time to Move or Remodel Your Existing Home? Rhonda and her husband had been in their home for twenty years and decided it was time to move or renovate. They really like their location, neighborhood and ability to walk downtown. 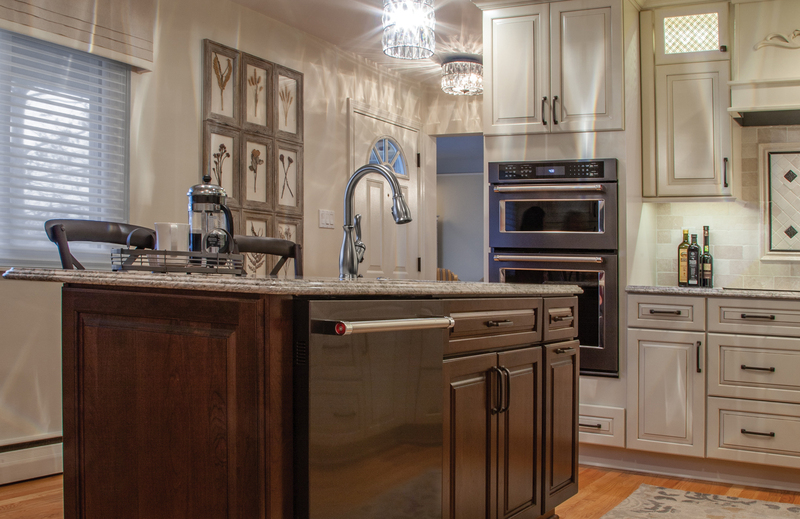 So, like many homeowners, they decided to do some research and look into remodeling their kitchen. As KSI Designer Shaynna reviewed their wish list and visited their home the biggest challenge was the smaller space. Trying to figure out a way to include everything on the homeowner’s wish list in this small kitchen without knocking down walls or changing the existing footprint. It required some “out-of-the-box” thinking and creative solutions. The homeowners had met with a number of contractors initially to research ideas and options. 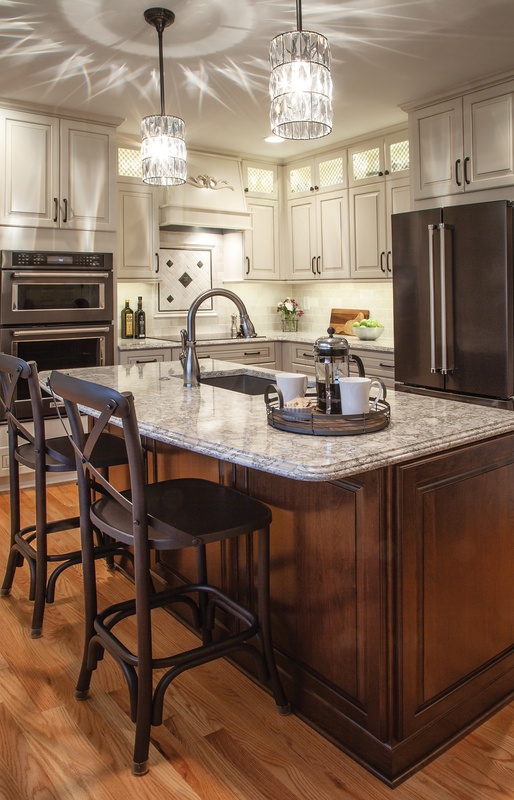 All of them came back with really large islands that left little space to move and function comfortably in the kitchen. Shaynna designed a 6’ island with a deep 10” sink. This allows Rhonda the ability to cook, clean and entertain while visiting guests can sit at the island and visit with her. The smaller island provided room for dining and work space at the counter while still allowing comfortable space to walk, move and work around. The Merillat Masterpiece Fairlane Square Cherry Kaffee cabinetry adds warmth to the room while tying in nicely with the wood floor. By removing the soffits they were able to add the additional Fairlane Square Maple Canvas cabinetry with a Mocha Glaze – stack the cabinets to the ceiling – providing more storage. 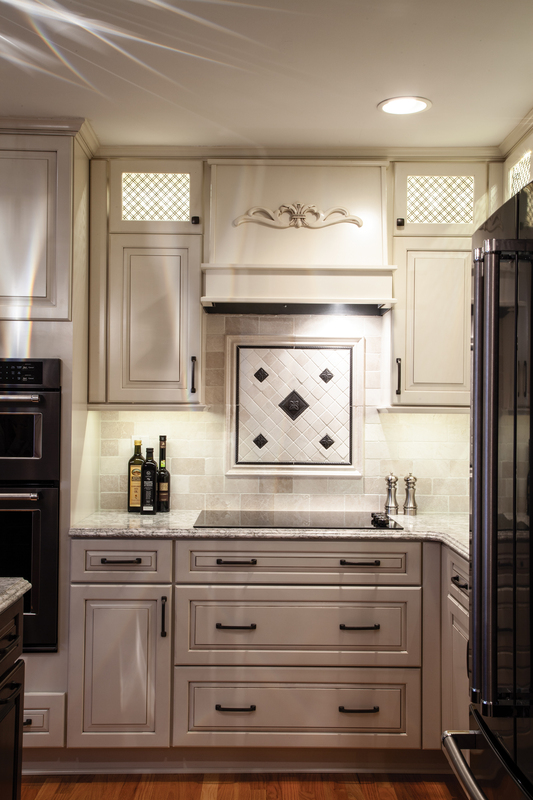 The additional upper cabinetry was designed with mesh inserts creating this beautiful design element. Shaynna recommended adding a hood element which is a great way to create an interesting focal point – it blends well with the cabinetry and the added onlay really plays up the dramatic effect. 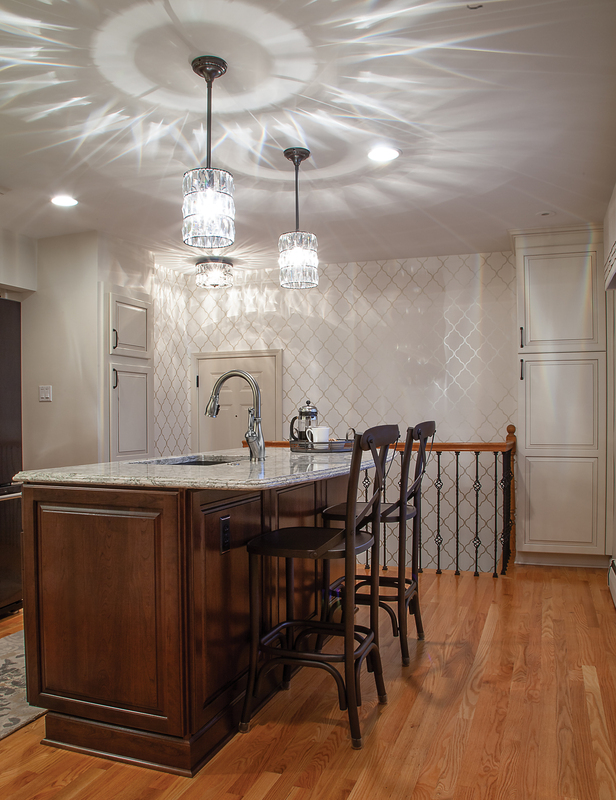 The backsplash provides an important function – protecting the walls from food spatters but it also can serve as a decorative element – as seen here. The square tile design was created by the homeowner. We say “Nice touch!”. Finally, the lighting was chosen by the homeowner and from a functional standpoint it really lights up the space. From a design standpoint, these glass and crystal pendant lights create drama with the light and shadows. The entertaining has already begun and the space is perfect – the chef never feels isolated from guests and the guests now focus on their host. All done in this wonderfully classy and functional new space. 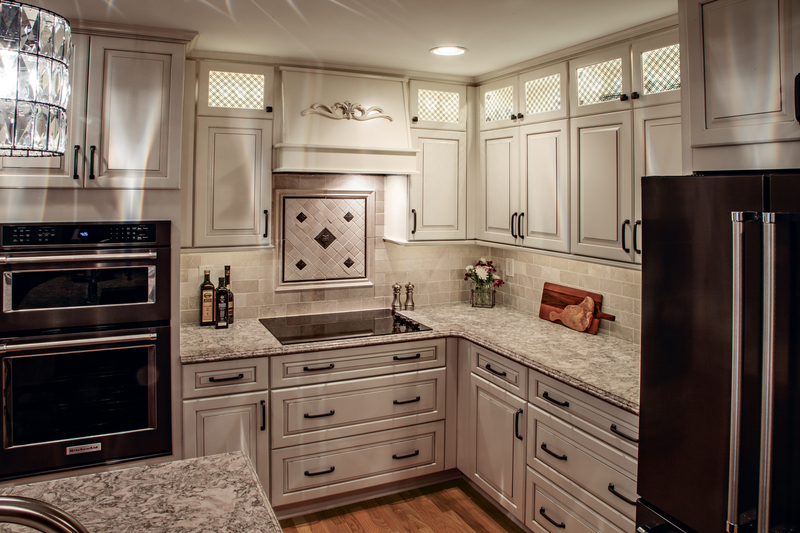 For more information or inspiration on your next home remodeling project, visit our KSI website gallery of images at ksikitchens.com/gallery. To learn more about your style, try the Define Your Style app.